Many of us are more fitness-conscious these days. We jog, do aerobics, dance. Yet although we might feel healthier as a result, playing sport can have a distinctly unhealthy effect on our feet. When we run, which we do in nearly all sports, our body weight is multiplied up to three times, with our feet bearing the brunt of this stress at every stride - over 1,000 per mile, per foot. An 11 stone man of average size will process 112 tons of weight through each limb per mile. Whether you are a professional athlete or play sport just for fun, the demands made on your feet and lower limbs can lead to a range of injuries, including blisters, sprained ankles, torn ligaments, shin splints, knee pain, low back pain and other joint or muscle problems. Added to these are common complaints such as corns, callous and athlete's foot, which may result from over use and exposure in communal changing areas. Asking 'too much, too soon' of your joints and muscles can lead to injuries. Running style, poor footwear and even minor limb length differences can also contribute to injury. Minor injuries are best treated by rest, gradually returning to exercise when any pain or discomfort has gone. If there are any cuts, cleanse them and cover with a clean dressing. Leave blisters unopened, if possible. I.C.E. - ice, compression and elevation - helps most minor sprains and strains. Minor ailments such as corns and athlete's foot are easily treated by the Chiropodist. If the problem is more serious, or if you are in any doubt, consult an Osteopathy or Chiropodist at Absolute Health for advice. We can offer treatment for a range of musculo-skeletal injuries, to speed up healing. To prevent injuries recurring, or indeed developing in the first place, you may benefit from a gait/biomechanical assessment. Our Chiropodists and Osteopaths are trained in Biomechanics - the study of how the body moves when we walk or run. They can tell if your particular style may be causing any problems or injuries. For example, our feet will roll slightly inwards (pronate) or outwards (supinate) when we move, but if they do this excessively, perhaps because we have inherited a structural problem with our feet, they will not function properly, placing abnormal amounts of stress on the lower leg, knee, hip or in the spine. One leg may be longer than the other, either from postural habit - twisting at the pelvis - or from a previous leg fracture/repair - you may need a 'heel raise' under one foot to realign the body and prevent problems higher up. We can prescribe corrective appliances (orthoses), moulded to the shape of your foot, which will help the foot function normally and distribute weight more evenly across the foot. Each sport has its own demands, and an appropriate appliance can be made to suit your sporting needs, whether you're a ballet dancer needing "arch supports", or a marathon runner with a tendency to form blisters. Orthoses can be worn during training or sport and should cut down the risk of sprains and strains. Many top class athletes require orthotic therapy. Orthoses, however, are not 'cure-alls', but merely compensate for any structural defects present. Footwear should be given the same consideration as any other piece of sporting equipment. Sports shoes should protect as much as possible, be durable and should be right for the sport and surface. If running, the shoe should have adequate cushioning in the midsole and a flared heel for stability. 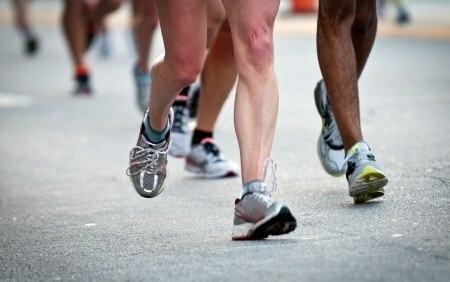 Lots of people, including a number of our leading sportsmen and women, have one foot longer or larger that the other. Make sure the bigger foot is comfortable within the shoe. Always remember the "Rule of Thumb". When standing in a sports shoe there should always be one thumb's breadth between the end of the shoe and the longest toe. Your Chiropodist at Absolute Health will be able to give advice on suitable footwear. They can suggest suitable 'warm up' exercises to ease you gently into your chosen sport to help prevent injury.